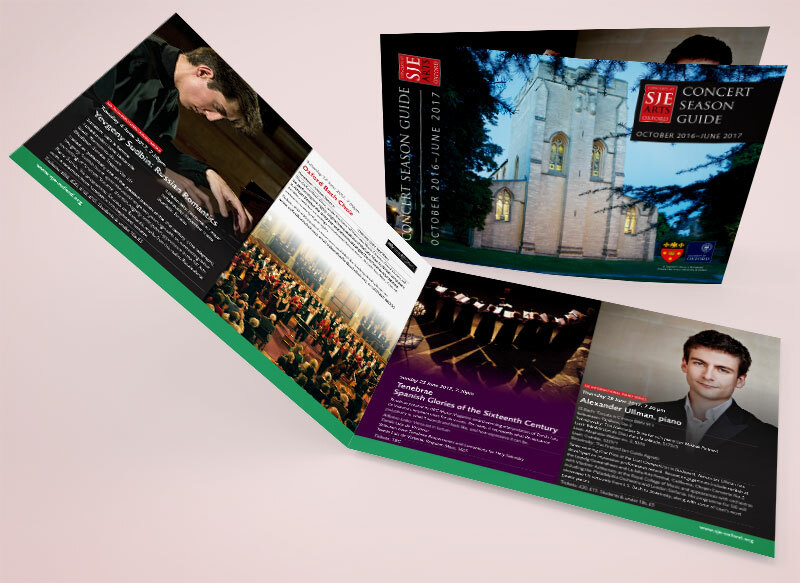 The 2016-2017 Concert Season Guide for SJE Arts was an opportunity to position a leading Oxford venue and promoter as both a host an organiser of high-quality musical events. The Guide is distributed throughout Oxfordshire and beyond, and so is a vital touchpoint for generating concert audiences at the venue's events. I worked closely with the SJE Arts team to create a style for the new Guide that progresses the designs used for previous publicity materials, fulfilling aims to represent the luxuriousness of the venue as well as the rich diversity of concerts it plays host to. A landscape format provides a sense of spaciousness, while retaining the practical value of a Guide that can be placed into public leaflet racks. A carefully-designed grid structure combines with consistent and refined typography to create a series of layouts that makes good use of photography, while carrying important information in a highly attractive and varied way. Printing on textured paper adds to the feeling of quality and style created by the Guide's design.